Since 1993, the Quilt Alliance has been committed to documenting, preserving, and sharing the stories of quilts and quiltmakers. We care about keeping quiltmaking alive, but also celebrating its history. 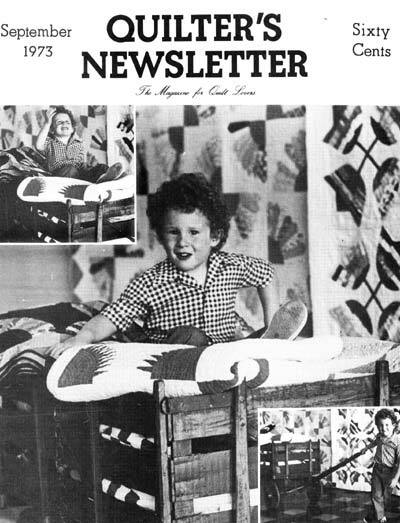 We shared this passion with Quilters Newsletter Magazine, the grandmother of all quilt magazines, in print since Bonnie Leman began the publication as a black and white newsletter produced out of her home in 1969. We at the Quilt Alliance were saddened to hear that F+W, the magazine’s parent company, announced that the magazine would cease publication. Quilter’s Newsletter, September 1973. Michigan State University Museum Research Collection, courtesy of Primedia, Inc. Image from Quilt Treasures, a partner project of the Quilt Alliance, Michigan State University Museum, and Matrix, the Center for Digital Humanities and Social Sciences at MSU. I admittedly don’t read all the quilt magazines. But QNM was one I paid attention to in large part because it cared about quilt history. It regularly published features that celebrated quilt heritage, quilt documentation projects, museum exhibitions, and summaries of quilt scholarship. The magazine, like the Quilt Alliance, perceived the stories of the quilts and quiltmakers of the past as integral to quiltmaking’s future. I was lucky enough to publish a few times in QNM, and always felt honored that a popular publication with large and faithful readership would feature articles by a historian like me. And that’s part of QNM’s legacy. QNM is part of our shared quilt history which the Quilt Alliance aims to preserve. The magazine was instrumental in the late twentieth-century quilt revival, not just through its publication, but through its outreach into the burgeoning world of quilt enthusiasts and its leadership in the quilt industry. 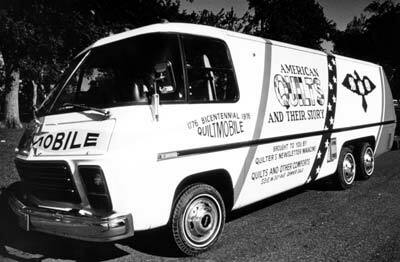 For example, QNM sent a touring Quiltmobile around the country in 1976, exhibiting quilts and teaching quilting, which no doubt helped fuel the quiltmaking excitement surrounding the American Bicentennial (we here at the Quilt Alliance are inspired by this… we’ve had our eye out for a camper to drive around the country recording quilt stories). These stories are worth saving, but we can’t do it alone. In 2002, Quilt Treasures—a partner project of the Quilt Alliance, Michigan State University Museum, and Matrix, the Center for Digital Humanities and Social Sciences at MSU—interviewed Bonnie Leman. Our partners created a mini-documentary and web portrait, but the technology supporting this presentation is out of date. watch an excerpt of Bonnie recalling the origins of Quilters Newsletter from her Quilt Treasures portrait. Like Quilt Treasures, our oral history project Quilters’ S.O.S. – Save Our Stories (QSOS) is now in need of conversion to a new platform, so we can continue to fulfill our mission of not only documenting, but also preserving and sharing quilt stories. Please join us as a member today or make a donation. Consider it a subscription to our mission, one that requires fuel and tending to document and sustain our community for years to come. We hope you can help.